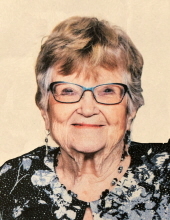 Mary Alice Kinch, lifelong Armada resident passed away peacefully surrounded by family on Sunday, February 10, 2019 at the age of 89. Mary was born July 26, 1929 in Armada, MI to the late Harlan and Pearl Townsend. She married Roy Kinch on June 4, 1950 at the Congregational Church in Armada and spent many loving years together until his passing in 2015. Mary’s family was her pride and joy. She and Roy were avid fans of their children and grandchildren. Mary enjoyed casinos, bingo and especially baking and gardening. She also enjoyed watching college football and basketball. Mary was a long time member of the Congregational Church in Armada. She will be greatly missed by all who knew her. Mary is survived by her children Jo-Ellen (Larry) Strace, William (Valentina), John (Laurie) and Michael (Lois); grandchildren Stewart III (Andrea) Ireland, Angela (Laura) Kinch, Nicholas (Angela) Kinch, Ryan (Jennifer) Kinch, Logan (Alicia) Kinch, Tyler (Heather) Kinch, Jake Kinch and Kila (Ryne) Broshears; great grandchildren Stewart IV, Hunter, Alexis, Addison, Ellie, Isabella, Morgan and Devin; great great granddaughter Aubree. She is preceded in death by her parents, husband Roy and brothers John and Robert Townsend. Visitation will be held Tuesday, February 12, 2019 from 2:00 p.m. to 8:00 p.m. and Wednesday, February 13, 2019 from 9:30 a.m. until the start of services at 10:30 a.m. at Tiffany, Young and Hauss Funeral Home, Armada, MI. Burial will follow at Willow Grove Cemetery. In lieu of flowers, memorials can be made to the Armada AmVets Post 93 or to the Armada AmVets Post 93 Ladies Auxilliary. "Email Address" would like to share the life celebration of Mary Alice Kinch. Click on the "link" to go to share a favorite memory or leave a condolence message for the family.